At The Storage Inn of Egg Harbor Township, we have a parking area dedicated exclusively to vehicle, boat and RV storage. Our facility is under 24 hour surveillance 7 days a week. If you're not a full time RVer you may find that your large recreational vehicle is taking up alot of extra space in your driveway or along the street. The Storage Inn of Egg Harbor Township has plenty of space for you to park your vehicle short or long term. 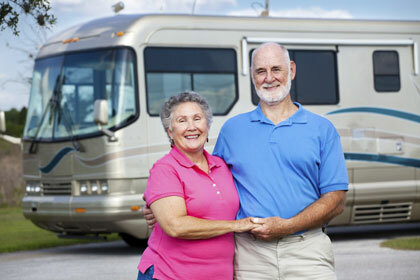 Purchasing a quality cover is a wise investment when storing your RV. Buy one made from a breathable material so that moisture doesn't build up inside your vehicle causing mildew and mold. Vehicles parked for an extended period of time often become new homes for an assortment of furry friends. Take the time to inspect under your RV for holes and patch with an appropriate sealant. Also be sure to inspect exterior areas for holes where rain water can enter and be sure to seal those as well. Clean all the interior areas and appliances. Empty all drawers of perishables and canned goods. Double check corners and crevices for food particles to ensure mice, roaches and other pests are not attracted to take up residence. If you can't periodically start the RV while in storage you can remove the battery and store it in your home for safe keeping. Lubricate all hinges and doors with WD40 and spray locks with graphite lubricant to prevent them from rusting. Defrost your freezer and leave the doors open. Place a box of baking soda inside the unit. Open all cabinet doors to keep them from getting musty.